Anyway, I ended up at The Carlton Hotel Guldsmeden for a couple of days in July when I was in Oslo doing some research for a travel story for the National Geographic Traveler. I was kind of in a hurry and I was desperate to find a hotel that could accept my fury friend (Sam). The Carlton Hotel Guldsmeden was the first hotel I found where dogs were allowed (that in itself is worth an extra star in my book). The Carlton Hotel Guldsmeden is small, family-owned and quite centrally located on Parkveien 78. The rooms are nicely decorated in neutral earth tones, but, they are really small. Really, really small. This is definitely a weekend hotel so you should keep your luggage to a minimum (there is no closet, only a coat hanger). But the fact that the room was tiny didn’t really bother me too much. Everything was clean, fresh and the service was super-friendly and that is more important than anything else. The breakfast room had a warm and cozy atmosphere and the buffet offered a wide range of mainly locally produced, organic food. Natural yogurt, cereals, wide selection of nuts, home-made jams… (I can go on forever). If I wasn’t in such a hurry, this is definitely the place to sit down with a warm cup of tea and chitchat with other hotel guests for hours. If you are visiting Oslo for a weekend and are not dragging along a big suitcase (and you’re not planning to spend most of your time in the hotel room), I would definately recommend Carlton Hotel Guldsmeden. What can we say? It seems impossible to explain in a blog post all the history, glamour and numerous stories associated with one of the most recognized names in the business – Hotel Martinez on La Croisette in Cannes. Here enter the Sam and the dunes team earlier this summer with Sam embarrassingly barking his head off. Polite faces turn, forced smiles from the staff, “Welcome to Martinez!” Personally shown to the room, water bowl brought for our four-legged friend, impeccable, absolutely impeccable. Martinez has the biggest private beach in Cannes; the fourth most expensive suite in the world; one of the best restaurants in France and if you really want to show off, book a sun-bed on the pier for a hefty 450 Euros per day. After some tough hours at the beach, get a treatment at L. Raphael Beauty Spa to tip off your afternoon before heading over to Bar L’Amiral. Jimmy McKissic no longer plays here (Alex knew him well and these days he is a classical pianist at Carnegie Hall in New York) but the crowd is as boisterous as always. Jazz and Blues rule and cocktails flow by the gallons. The stories never end, who did what during this or that Film Festival, celebrities going crazy and the rich indulging in everything available. With Bentleys, Ferraris and Rolls Royces constantly parked outside (just a reminder who tends to frequent Hotel Martinez), this place is visibly a goldmine for paparazzi and tabloids. One thing, though, some of the rooms have not been refurbished for a long time so make sure to check if yours is of the new type (the old ones are OK, but not really up to the standards of this hotel). Will we come back? You bet! (Not you, Sam, this was the last time you stayed in a five star hotel. Period.) Hotel Martinez is a one of a kind experience that you cannot match anywhere else. Here are some photos of us enjoying Hotel Martinez. If you are the type who ventures into the city in the middle of the day, sweating buckets, looking for that bargain hotdog stand – stop reading now! 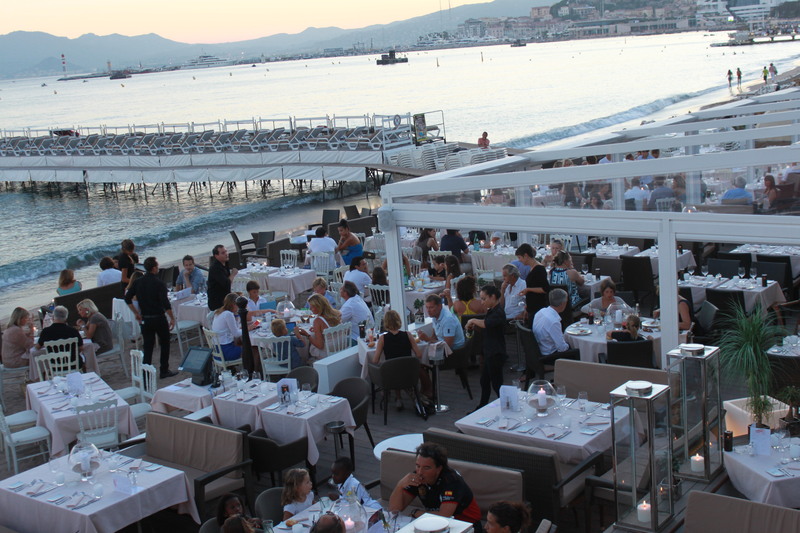 However, if your understanding of a pleasant lunch is a glass of chilled Chablis, some exquisite food, all located a few steps from your sun-bed, then go no further, here is your ultimate guide to the best beach restaurants in Cannes. These three places have many things in common: mouth-watering food, eye-watering prices, efficient if a bit slow service (but then again, who is in a hurry). Every summer during the fireworks festival they offer additional seating so you can view the spectacular show while chewing on a shrimp. Miramar Plage is probably the best of the lot that caters both lunch and dinner in a pleasant setting. 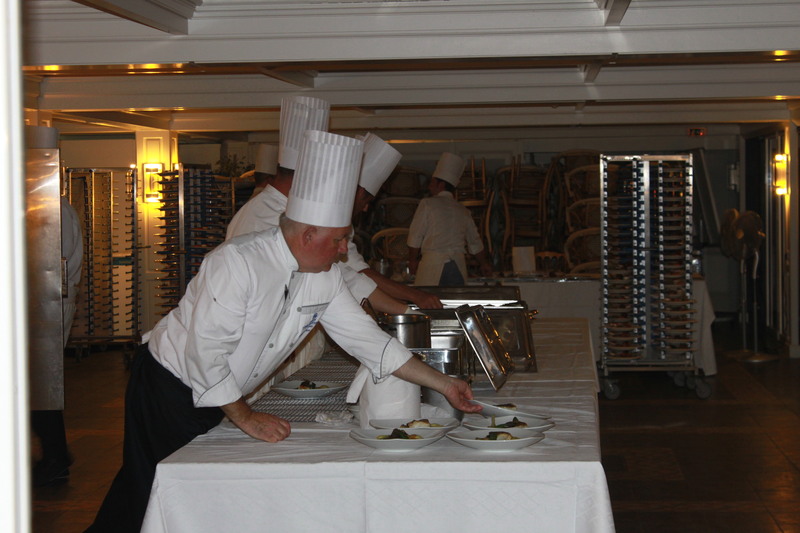 The food is top-end gourmet including some outstanding seafood. The wine list is extensive but avoid asking the waiter for advice, he will point you to the most exuberantly over-priced bottle and if you are as polite as Alex, you will end up buying it (poor fella). Rule of thumb: for White and Rosé pick between 30 and 60 Euros, go up slightly if you choose a Red. Since we stayed at this hotel, most of the time we also ate lunch here. The food at Zplage is a concoction of traditional Mediterranean and Asian (woks are prominent on the menu). The dishes are somewhat bland, so if you are into spicy, this restaurant should not be your first choice (or ask for Tabasco, as we did). One of its claims to fame is a 54 Euro (appr. 70 USD) hamburger. We thought we found the most expensive one in Hotel La Mamounia in Marrakech, but no, this one outdoes it in price (and size). Here, Hanna recommends the shrimp wok and Alex – the Black Angus filet steak. Probably the most luxurious of the three where the really glitzy crowd descends in the evening. Celebrities just can’t keep their hands and stomachs away from this place. The food, as expected, is reliably good as is the service and the ambiance. Carlton Beach Restaurant is the biggest, so during fireworks season you have a better chance of getting a table here at short notice than at the other two establishments. Psst, between us, but keep it quiet, OK? We also went to a hotdog stand a couple of times on La Croisette. Try Le 6, top of the top. The best hotdog it town! On our way to visit Grasse, a small picturesque village in the south of France, we asked our taxi driver if he could recommend us a good lunch place. He gave us a name of one of his favorite restaurants and insisted that we can’t bypass it. “The olive oil they use is locally produced and you’ll love the food!” he told us. Since we were not even slightly dressed up, we assumed he had recommended us a charming family owned little restaurant somewhere in the countryside at dirt cheap prices. Boy, were we wrong. The little hole-in-the-wall-cafe we had expected ended up being a world-renowned Michelin star restaurant – La Bastide Saint-Antoine – owned by chef Jacques Chibois. And to our horror we had arrived to this top-notch gourmet restaurant, located in the middle of nowhere, with one of the nicest terraces we have ever seen, overlooking a beautiful valley – wearing flip-flops and shorts!! Trust us, we were in stark contrast to everything this place is famous for – class, taste, sophistication. We desperately waved to the taxi driver (we have to leave now, we are NOT dressed for this!!) but it was too late, the car had already disappeared around the corner. However, to our continued surprise, we were allowed in (note to ourselves: don’t make that mistake again, next time they might ask us to leave) and shown to a delightful table. And surprises didn’t stop here. Being aficionados of good food, we know how much it costs to eat in such a restaurant. However, the lunch menu was at a fixed and very reasonable price. The fois gras, the shrimps (as starters) were beyond words. The sea bass (as our main choice) could hardly be more recommended. Pencil in the view and we probably found one of the most romantic and idyllic hideaways in south of France. The restaurant is part of a boutique 5-star hotel (Relais and Chateaux group) and a weekend here is something we would whole-heartedly recommend. There are luxury hotels, and there are LUXURY hotels. 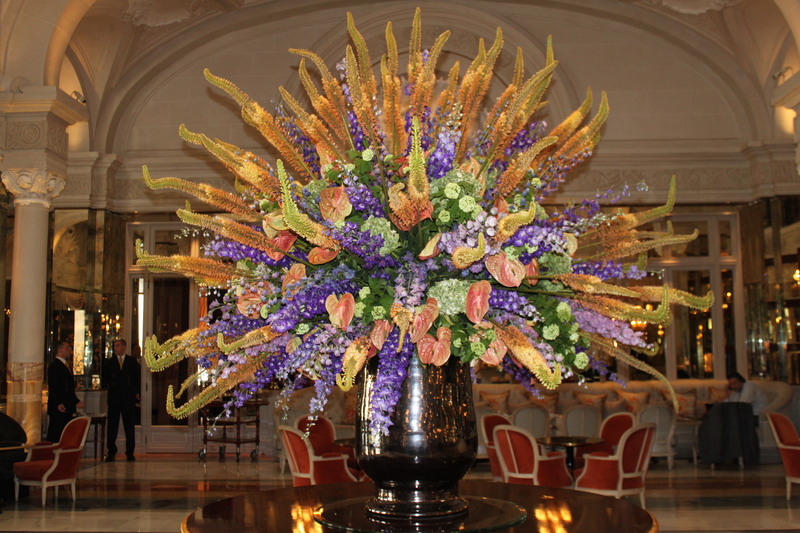 Hotel de Paris in Monte Carlo definitely belongs to the second group. We have written about James Bond in a previous hotel review but here it would actually be a disservice to our readers not to mention 007. With all the glamour and flair this hotel radiates, no wonder a couple of James Bond movies were filmed on its premises. In fact, it’s not hard to picture Sean Connery elegantly entering the lobby, charmingly looking around with glitter in his eyes before he sits down for a martini at Le Bar Americain. The hotel has also been featured in two additional Hollywood blockbusters, Iron Man 2 and Madagascar 3, while plenty of other movies have been filmed in the vicinity. To be honest, we really couldn’t find anything to fault Hotel de Paris (what were we expecting?). The service was exquisite, quick, efficient and non-intrusive. 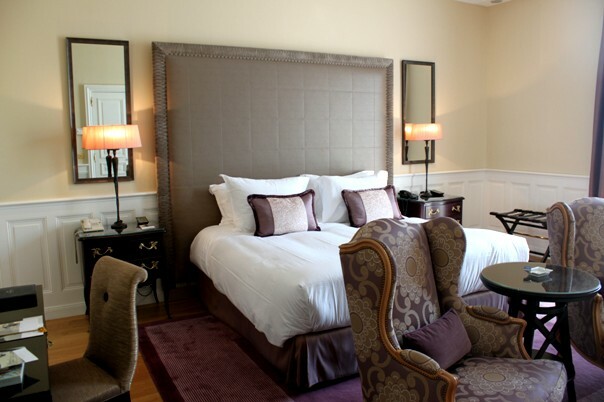 The hotel, which was established in 1864, has “chateau-like” rooms that are beautifully decorated, spacious and offer everything imaginable. In the evening, Le Bar Americain will entertain guests with some jazzy tunes and if you are up for a game of roulette (of course you are), the Monte Carlo Casino is located just across the street. The hotel is a regular item on the Conde Nast Traveller Gold List and to sum it up – you will not be disappointed staying at Hotel de Paris in Monte Carlo. All your needs will be taken care of (for a hefty price, of course). 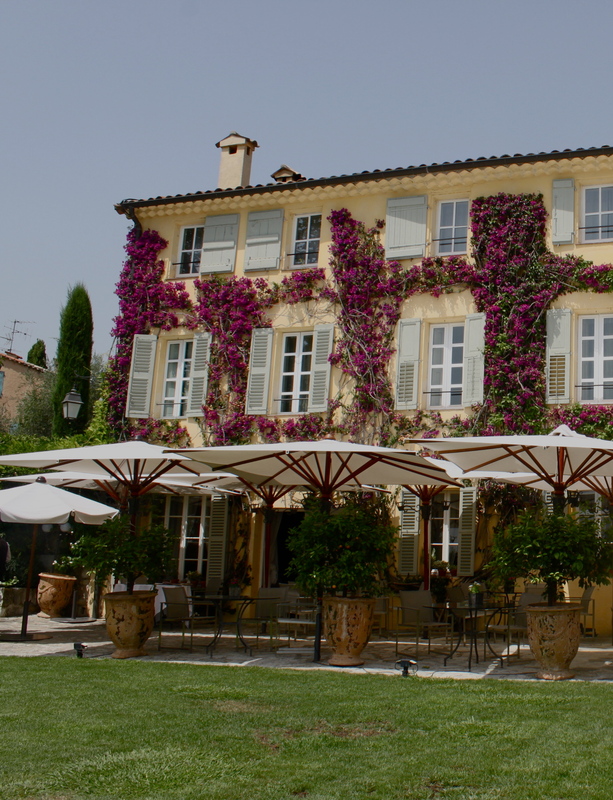 Hotel Benkirai in St. Tropez is advertised on several travel websites as a five star establishment, which it is not. It is in fact a nice four star hotel to spend a few days enjoying life on the French Riviera. It’s located only a five minute drive from St. Tropez with all its beaches and jet-set life this former fishing village, turned glamour capital, has to offer. The hotel has an excellent taxi service free-of-charge until midnight, so you can easily go to town or enjoy the beach whenever you feel like it. The hotel itself is very pleasant with a lovely restaurant/bar area, a nice pool and plenty of comfortable sun beds (in the morning you are not stressed looking for a place to put down your old bones to get some tan). The rooms are small, that is a fact, but rather well designed in light blue and white colors. You have either a nice terrace or a balcony. 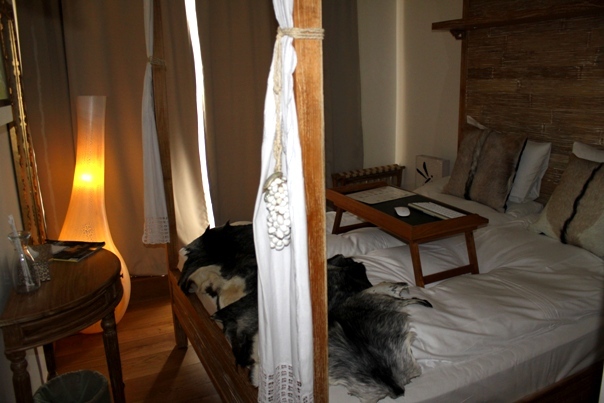 You may feel a bit claustrophobic, but then again, who comes to St. Tropez to hang around in the hotel room? The restaurant serves traditional Mediterranean food in a tranquil setting and is an excellent choice if you don’t have the energy to take the taxi downtown. Being rather picky travelers, we were not able to fault the service even one small bit, everything was top notch. And most importantly, Sam (our dog) was very much welcomed. 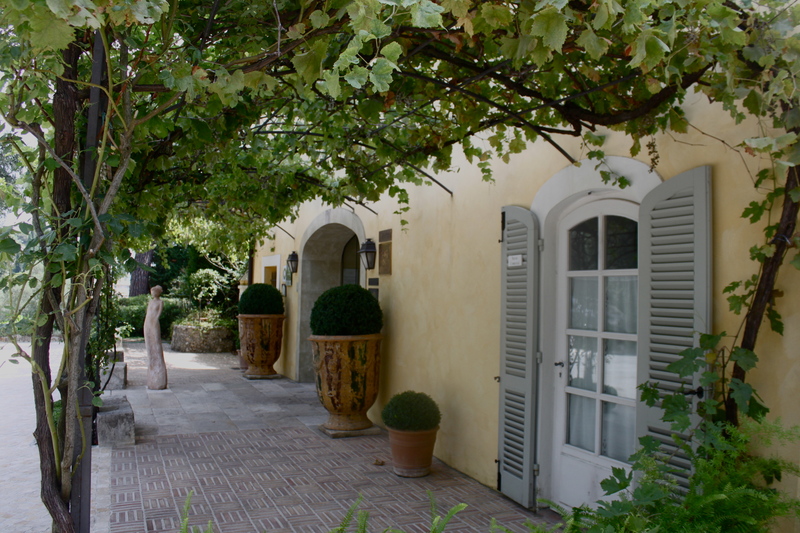 So if you are planning a visit to St. Tropez and don’t want to stay in the town itself, don’t hesitate to book Hotel Benkirai, it’s an absolutely beautiful place with plenty of charm.